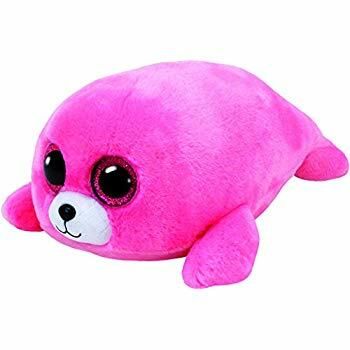 Pierre is a pink seal with a white muzzle. He has large, glittery pink button eyes and a black button nose. Pierre has two, tiny pink flippers either side of his body. while I nibble on a peach! Pierre was released on 1st July 2016. His Birthday is on 22nd January. There are three versions of Pierre. This medium 9″ Beanie Boo Buddy, a small 6″ Beanie Boo and a key clip.